Last night I watched one of my all-time favorite sports stars lose what may be the last game of his career. 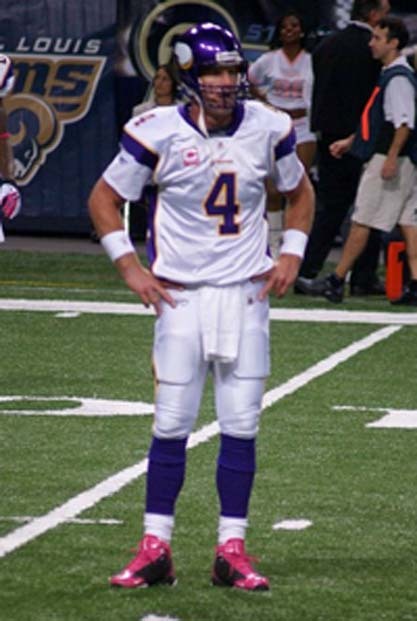 In a vaunted effort that says as much about his real character as anything, Bret Favre got up from violent knock down after knock down to lead his team to the brink of a trip to the Super Bowl. But he came up short — and nothing contributed to that more than a silly interception he threw at the end of the fourth quarter, ending a drive that looked as if it would result in a Viking score and win. That interception added to a record that Favre holds — most career interceptions thrown by a quarterback in the playoffs. But in his valiant effort, Favre also set two other career playoff records – most pass completions and most passing yards by a quarterback. Along the way to those completions and yards he’s achieved some remarkable things, including a Super Bowl Victory; starting an incredible 309 games in a row, with no one even close to that record; three times the MVP of the NFL and 11 times a Pro Bowl selection; most career passing touchdowns, yards, completions, and yes, interceptions. If you really look at what Favre’s achieved (and this is true for all great achievers), it’s clear as a bell that the reason he succeeded is because he wasn’t afraid to fail, and he did so often – in order to WIN. Now, go throw some interceptions in your life! Our friend, mentor and inspiration to millions, Jim Rohn, graduated from this life on Saturday. My great friend, Bill Rosselle, introduced me to Jim in the 1990’s through a tape set that he loaned me. Needless to say, my life hasn’t been the same since. Like so many, it was Jim’s simple wisdom that always spoke to me so strongly. And having had the privilege to spend some time with Jim personally, it was the kind of wisdom he lived. Unlike so many of the so-called heroes of today, this hero — an icon of the grandest sort — walked his talk. I was almost 50 years old by the time I met Jim, but he’s one of those kind of people that you feel like you’ve known your whole life. Nothing apparently pretentious about him. No need to impress. It was some of the highest points of my life when we spoke together at our Claim Your Power Now event in Dallas and he appeared again at our Claim Your Power Now event in Atlanta. But I will always cherish above those, the interview I got to do with him for our Goals 2 Go TV show. We recorded it on the first day (I think it was the second show I did that day) and I was fighting a major cold, nervous and excited all at the same time. But he was Jim. Acting like the guy who had spoken to 6,000 audiences, it was just another day at the shop to him. And that, along with his quiet encouragement, put me at ease. I want to share that interview with you below, in the hopes you will get as much from watching it as I got from doing it. And if you wish, please leave your comments about Jim below (and please feel free to DIGG this and otherwise pass it along to others starving for this kind of message). Watch the video below for all the details and your special Free Party Favor for being part of my online birthday party. Short video. Huge Announcement. Watch it now!